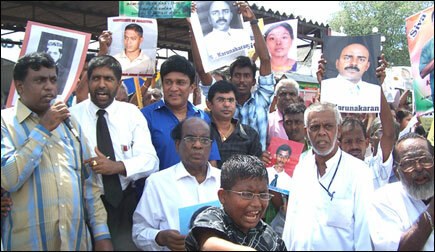 Committee for Tracing the Abducted Persons held a demonstration in Colombo Fort railway station Wednesday 12:00 noon demanding the release of persons abducted in Colombo and the suburbs, and urging civil society to pressure the Sri Lanka government to take urgent steps to prevent future abductions, civil sources said. Wickremabahu Karunaratne, the President of New Leftist Front, Mano Ganeshan, the President of Western People's Front, Tamil National Alliance parliamentarians N. Raviraj and M.K. Sivajilingam, the relatives of the abducted persons and concerned members of the civil society participated in this event. 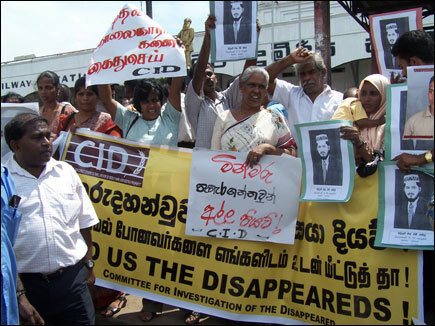 The participants directed their accusations on the Sri Lanka Government, shouting slogans including "Government is responsible for the abductions," and "Sri Lankan Forces and their allied Paramilitaries abduct the persons." The protesters displayed the photographs of the abducted persons. Vehicular traffic was disrupted during the picketing, sources said.